3GSM World Congress -- The HP iPAQ 500 series Voice Messenger is the first of what is expected to be a number of Windows Mobile 6 smartphones to be announced at 3GSM. The small (for an iPAQ) device looks more like a phone than past smartphones from HP. 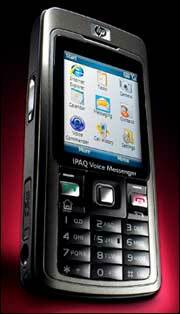 The iPAQ 500 Voice Messenger will be available this Spring in the US. International availability will follow shortly. Pricing for the device was not announced.